I’ve been a huge fan of the try! Swift conference since its inception. 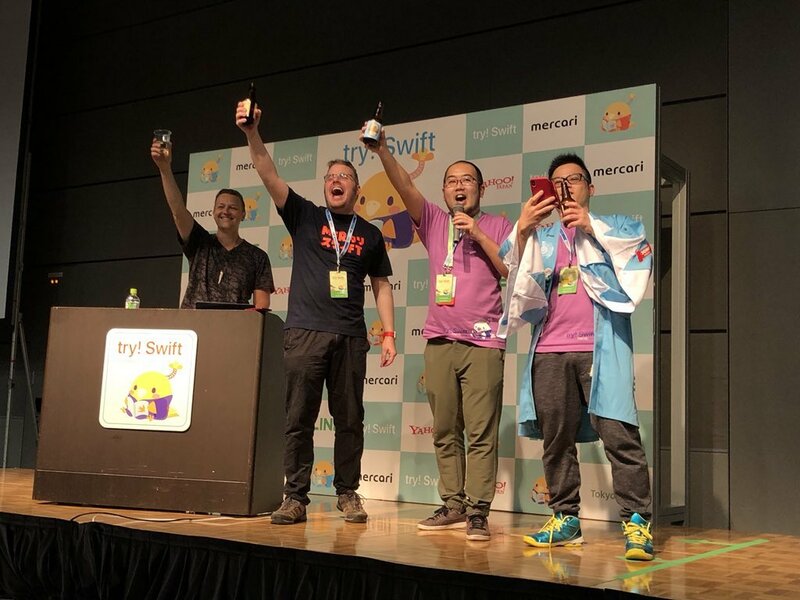 It’s arguably the biggest and influential conference about Apple’s new programming language, and the Tokyo conference is hands-down one of the most amazing and important cultural bridges in the Apple platforms community. I presented at try! 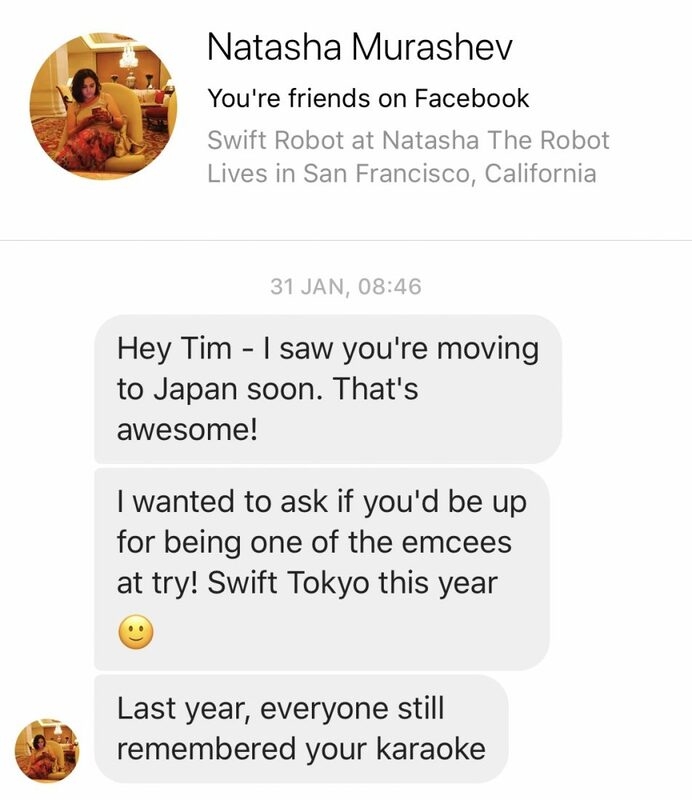 Swift 2016 (In Japanese to boot) and had an extremely chill time at the one in 2017. Sadly for try! Swift Tokyo 2018, I’d already committed to starting my first day of work at Mercari on March 1st. The same day as try! Swift. I was figuring it’d be incredibly poor form to rock up to a company to promptly take the first day off, so I resigned myself to the fact that even though I was in town, circumstances would mean I’d have to skip it. Maybe I could at least go say hi to friends who were in town in the evenings. I was absolutely floored! I’d always wanted to try being an emcee, but usually in my line of work, it rarely comes up. I was so amazingly over-the-moon that Natasha had considered little old me. There wasn’t a lot I could say. I knew I’d regret it to my grave if I said no, so I said yes. I said yes knowing I had no idea if I would be able to even make it. But dang it all, I would move heaven and hell to make it happen. I went back to Mercari HR and asked if there was any chance of bringing my starting date forward. Thankfully they were really awesome about it and found a way! Thanks to the fact that I had worked in Japan before, I could actually join one of the smaller on-boarding sessions happening in mid-February instead, freeing up March 1 for try! Swift! So that was that! I was committed! There was just one problem. I mean. Sure they’re the folks at conferences who introduce the speakers, but is that really it? I wasn’t exactly sure what I’d have to do in order to prepare for this. Fast forward to the day of the conference. I was so incredibly nervous, but so excited! Thankfully, as it turned out, everything went down without a hitch. One of my coworkers, Hideyuki “jollyjoester” Nanashima had also volunteered to emcee for everything in Japanese. This ended up being a fantastic combo, not just on stage, but also since we would receive information from various sources (ie from Natasha in English, or from conference volunteers in Japanese) and translate them across languages accordingly. The quality of the speakers were absolutely unreal, with a lot of friends I’d made when I was living in SF making the journey over to Japan. By far, the most absolutely amazing speaker was someone from, AND REPRESENTING Apple on stage, where they announced a new library from Apple for Swift, and then promptly open-sourced it ON STAGE. That one had me trembling from nervousness. Apple normally doesn’t DO that kind of thing, so it was an absolutely amazing privilege to be able to witness that. That being said, I learned a LOT of lessons from the experience that I thought I’d share here. A LOT of the time I spent speaking was from reading passages, whether it was speaker talks, sponsor messages, or general announcements. Since I usually never ‘read’ things verbatim out loud, I discovered I’m actually crazy rusty at it. This is something I’d say that everyone needs to keep practicing. While jollyjoester had his laptop, I had my iPad to read off announcements. I think in hindsight, the laptop was way better. iPads have a nasty habit of scrolling around if you accidentally brush the screen (Which is easy when juggling it with a microphone), and I had a few moments where I had to pause to get back to the spot I was reading from. Making everything look natural is a very interesting art form. By the end of the first day, my voice was already failing from all of the talking/shouting/screaming I was doing. Thankfully, on the way home, I stopped at a convenience store and bought a minty spray that I could squirt into my mouth to soothe it. Never forget to look after your voice.